I'm all out of words. Three weeks to manuscript and I don't feel like writing. So here are some photos taken over the last few months. 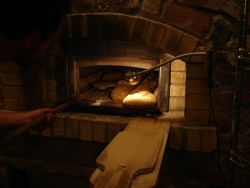 This is the wood-burning Alan Scott oven at Headlands Center for the Arts. 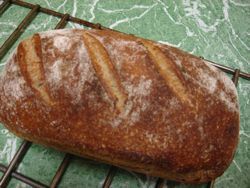 My friend Eduardo Morell has generously shared his sourdough bread baking skills and methods with me for my new book. This is a photo of Eduardo at work on a Friday night before the Saturday Berkeley farmers' market. This is a loaf of sourdough half wheat shaped with Eduardo at his house the day we adapted his recipe down for the home cook. Baked at my house. It turned out perfect! Preshape phase of my Cornmeal Pumpkinseed loaf developed on my own from my starter with Eduardo's method. This bread is superlative toasted! 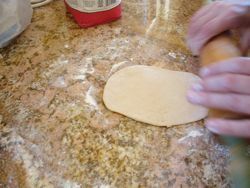 Rolling out a flour tortilla. 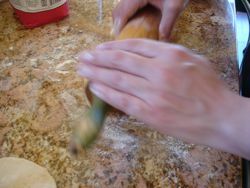 The tortilla in the pan just after flipping. Look at those nice air pockets! The tortillas made into a quesadilla with homemade cheese and salsa. These were great. 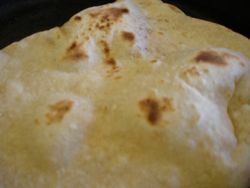 Light, crisp, great texture and flavor from a small amount of whole wheat flour. Wonderful the next day with butter and cinnamon sugar. 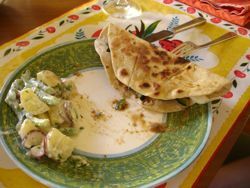 No more store-bought flour tortillas full of additives! 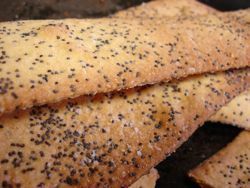 Parmesan-Poppyseed Crackers. Easier than pie! 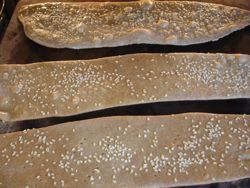 Whole Wheat Sesame Crackers: I wasn't trying to knock off my favorite Ak-Maks but it seems I did. 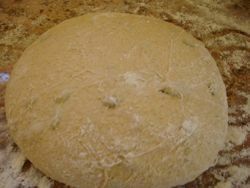 This entry was posted in DIY, breads and pizzas. Bookmark the permalink. Post a comment or leave a trackback: Trackback URL.